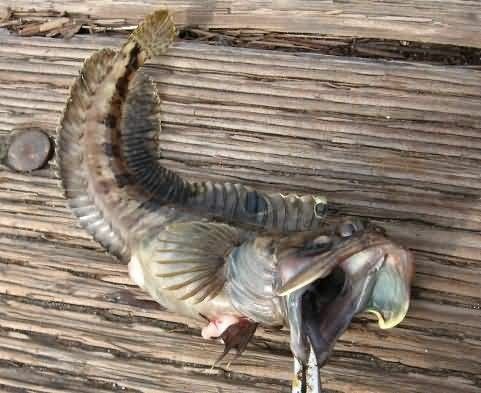 The sarcastic fringehead is a small but ferocious fish which has a large mouth and aggressive territorial behavior, for which it has been given its common name. When two fringeheads have a territorial battle, they wrestle by pressing their distended mouths against each other, as if they were kissing. They can be up to 30 cm long, elongate and slender. They tend to hide inside shells or crevices. They are found in the Pacific, coast of North America from San Francisco, California to central Baja California.